The mystery of Brian Loftin’s woes is solved. For the first two weeks of the Southern Mod Tour Season Brian Loftin's #23 machine hadn't made it to the green flag. 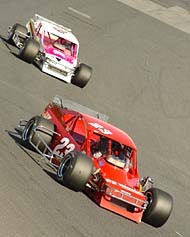 A mystery problem had prevented the #23 from starting each race. Brian and the crew were pretty confident they had the problem solved before the race but admitted they were still nervous. Loftin finally made it past the green flag. It took him until the third race, but as they say, the third time's a charm. Loftin's third Tour race past the green flag proved fruitful with a third place effort. Loftin was all smiles after the race. “It's a big improvement ain't it? And Myers noted that if things aren't going well, you may see him chomping away in his racecar. But sometimes the gum doesn't get chewed. The gum taped in his car is just another reason why Burt Myers is one of the more colorful characters on the Southern Tour. “I had everything crossed. I would have crossed my legs if I could have reached the pedals. “Everything worked out great. I think we have a real good start now to build off of. Spotting them those two races isn't easy but we will be back. We've learned a few bugs we've got to work out running behind these boys. We are about two races behind these boys and to come and run in the top-three, we are pretty happy with that. We will go back and work on it a little more and will be even better when we come back." STICKY SNACK THE KEY FOR BURT MYERS? Before the drivers pulled their cars out on the track at Caraway for the autograph session, Burt Myers was swiftly walking to his #1 car with two foil wrapped pieces of gum in hand. Why? Everyone else on the Southern Mod Tour gave another sigh of relief at Caraway. That is because the man that clearly is one of the fastest cars, had engine problems for the third straight race. 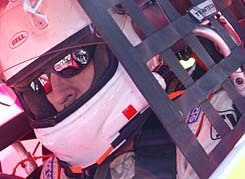 Burt sticks his sticks of gum inside his racecar before each race. The problems have Hedgecock very frustrated. “We've been having motor problems,” said Hedgecock. “We had problems the first week. Then the second week, the kill switch we run on the steering wheel shorted out. 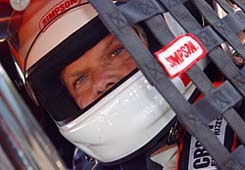 I lost 25 laps that night and we still had a skip in the motor. We thought it was the carburetor. So this week, it skipped, a intermittent skip in practice. Even though we sat on the pole, it did it both laps qualifying. “When we started the race, it was missing. It got worse and worse and worse. Sometimes it felt like it was running on five or six cylinders. “We wound up getting shuffled back to forth. And we later found out that when they worked on the motor the week before, they didn't tighten up the spark plugs. All eight spark plugs were basically two rounds away from falling out of the motor. Tim Brown unloaded his beautiful new Haye's Jewelers #83 for only the second time this season. And boy was it fast. 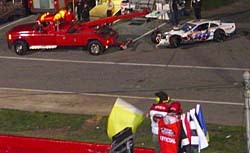 Brown was in third much of the night until something unusual happened to his new racecar. Sparks could be seen coming from the bottom of the #83 and it was evident that Brownie had his hands full. “We came in and they jacked the car up and it broke the frame. I mean it broke the frame. This is a brand new '05 racecar and it broke the freaking frame. “I don't understand how we didn't wreck the thing. I mean it beat the sheet metal, the driveshaft, the transmission, the frame and body. It beat everything up in there. It's crazy. It's a brand new racecar in its second race we've got with it. I don't know what the deal is. The cross member to the torque arm in the racecar broke and that knocked everything over into the driveline. It kind of messed up my new racecar real bad. Burt Myers won race number two at Caraway and looked to have this race wrapped up as well. But Junior Miller's late race charge put an end to the repeat hopes. Myers, who wasn't driving the same car he won with last week, was happy with the run. Jay Foley, who has been one of the most consistent cars over the first two weeks of the Tour, fell on some hard times at the third stop at Caraway Speedway. His #57 didn't look as strong as usual until a late-race charge. But it was too little, too late for Foley, who settled for a seventh place finish. “We had a pretty good car and got shuffled to the back early in the race,” explains Foley. “We got back up to fifth at the end and had a shot at getting a few spots. But we pushed the car so hard it got loose. We ended up losing a few spots. I'm glad to come home seventh with as bad a night as we had. We've run something different all three times we've been here, so maybe we can look at that and figure out what to do for the next race. With Junior Miller's victory, Foley dropped to second, four points behind Miller in the standings. 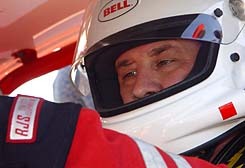 For the second straight week, Jersey-racer Brian Crammer was flying. He paced himself much of the night, and at races end, the #89 was on rails. 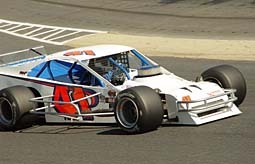 But during his charge, incidental contact with Frank Fleming sent Crammer into the wall hard and ended his night with a disappointing 18th place finish. Fleming felt bad for what happened with Crammer. VETERAN FLEMING SAYS THE OLD GUYS CAN STILL DO IT! Frank Fleming was happy at the end of the race. Not only was his #07 one of the cars to beat at Caraway. But in a sport where pubic perception says that youth rules, his run and Junior Miller’s win bodes well for the veterans of the Tour. Northern-invader Ted Christopher, who marched in and stole the season opener, didn't have the same result during race three. Christopher and the Hillbilly Racing #79's struggles started before the green flag even dropped. “I think this is about two weeks in a row that I think we had them covered because everybody wants to run balls-to-the-wall and burn their tires off,” said a charged up Crammer. “I was running 13th early in the race, hanging back and with 20-to-go, we were the fastest car on the track. Fleming started off the night strong before fading when the handling went away. He still finished 11th. 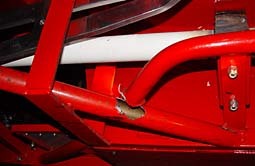 Jason Myers had such an ill-handling race car at Caraway, that it hurt... literally. “My shoulder is bothering me pretty bad,” said the younger of the Myers brothers. “When you're racing you don't notice it. But when the caution came out I knew my arm was pretty sore and cramped up. I guess I just didn't realize it and didn't try and work it out. 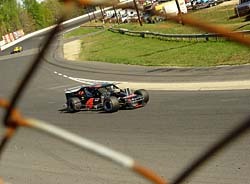 Despite the ill-handling car, Myers finished 12th. “The left rear tire went flat before the start,” said Christopher. “So then we pitted and wanted to put a tire back on and we wanted to put a good one back on and they wouldn't let us put the good one on. That was a used one we put on. The stagger was off. That just ended up working the right rear tire too much and that just killed the right rear. Nothing like a three-legged racecar. Both Brian Crammer and John Smith had wrecks take them out of contention during race three on the Tour. The two drivers got together on the backstretch and Smith was not happy with the outcome. “This week I had a real good car,” said a frustrated Smith after his 20th-place finish. “I was passing, or at least trying to pass that Crammer boy. I was on the outside of him. I guess he just turned right, or his spotter said something. I don't know. They have to get together because I was halfway up on him. Crammer admitted he was to blame for ending Smith's night. “I probably would point the finger at me. But I don't have amnesia either and he ended my season two years ago, so I don't feel bad at all,” said Crammer after the race, referring to an accident between the two at the North-South Shootout two years ago. Michael Clifton closed out his third race on the Southern Tour with what he considered a sub-par performance. But really when you come to think of it, leaving Caraway with a ninth-place finish and fifth in the standings isn't too bad. Clifton's car wasn't great but as he points out, this competition is enough to do anyone in. “We didn't have too good of a night,” said Clifton. “When we come back in July and we will be better. Several observers of the race at Caraway cringed when they witnessed Ted Christopher's spin on Saturday night. 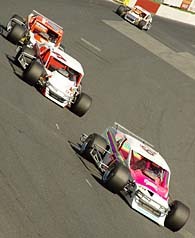 In the center of turns one and two, Junior Miller tapped the #79, and around went Christopher. But TC wasn't mad about the contact at all. Miller went on to win after the contact and also said that it wasn't a dump. TC finished 10th at races end. (Top Photo) Tim Brown's new #83 car. Hedgecock's car has been fast, but he has had mechanical problems each week.